Spike In Heroin Use Can Be Traced To Prescription Pads Heroin overdose deaths have increased significantly in the U.S. over the past five years. Experts point to aggressive prescribing of opioid drugs for pain about 15 years ago as a reason why. Heroin users often say their addiction began with exposure to painkillers like OxyContin. Experts say today's heroin problem can be traced back to the aggressive prescribing of opioid drugs like OxyContin about 15 years ago. The death of actor Philip Seymour Hoffman has brought attention to a grim reality of drug abuse in America — most notably with the increasing use of heroin. Hoffman was found dead in his apartment on Sunday, and New York police are investigating his death as a possible drug overdose. Hoffman struggled with drug addiction throughout his career. This is not the first time heroin use has skyrocketed in the United States. In the 1970s and '80s, the drug took hold in urban centers. But now officials say it is reaching the country's heartland, flooding across the southwest border from Mexico. "You didn't usually think of heroin as suburbia, as rural America, and that's what we're seeing," says Joseph Moses, spokesman for the Drug Enforcement Administration. The result, however, is the same. "If you look at just the raw statistics," he says, "over the last four or five years, heroin deaths went up 45 percent." John Venza is on the front lines of treating addicts. He's the vice president of Outreach, a substance abuse treatment agency in New York. Venza says heroin is cheaper than buying prescription pain medication on the black market — at first. "Folks often say it's cheaper, and I tell folks it's cheaper in the beginning, but when the person begins to use more and more, and the progression of the addiction marches on, then suddenly the couple bags becomes 10 bags or maybe even upwards of 20 bags a day — and then it gets pretty costly," Venza tells NPR's Melissa Block. Depending on the kind of pain pill, each one can cost about $20 or $25 on the street, he says; a stamp bag of heroin can cost between $7 and $10, depending on the quantity. Venza is seeing a rise in heroin-related overdoses, and says use is starting younger and younger. "We have recently [begun] treating a person as young as 13 in one of our residential facilities." And kicking heroin takes awhile. It's a chronically relapsing condition, he says, and not one that can be shed by simply going to detox and some in-patient treatment. "There's no way to get around that." Experts say the problem can be traced back to the aggressive prescribing of opioid drugs for pain about 15 years ago. 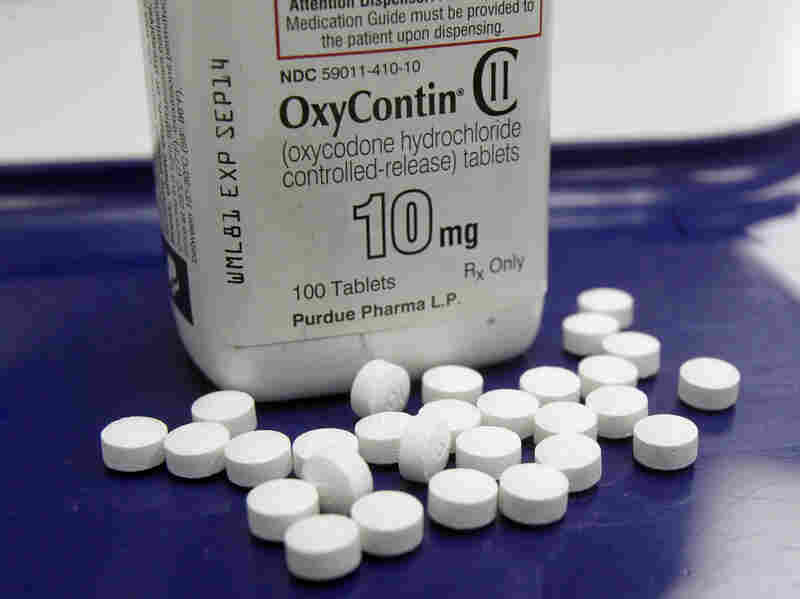 OxyContin and Percocet are two popular, legal opioid drugs. Heroin is also an opioid drug; it's the illegal cousin. They are all made from the poppy plant, and they are all addictive. When you talk to people who use heroin today, almost all of them will tell you that their opioid addiction began with exposure to painkillers, says Dr. Andrew Kolodny, chief medical officer for the Phoenix House Foundation and president of Physicians for Responsible Opioid Prescribing. "The main reason they switched to heroin is because heroin is either easier to access or less expensive than buying painkillers on the black market," he says. Kolodny says the statistics are stark. Areas with the highest rates of opioid or heroin addiction are often wealthier areas, where people have more access to medical care. With medical care comes access to doctors — doctors who could write prescriptions. "Often [it was] a doctor who meant well," Kolodny says, "not a doctor who was a drug dealer, but a doctor who may have been under the impression that the compassionate way to treat a complaint of pain was with an aggressive opioid prescription." Over time, however, it became harder to get opioids. As patients became addicted, doctors began cutting back their prescriptions, drug companies agreed to make the pills less snortable, and states created registries of patients who doctor-shopped for prescriptions. Experts say that's when heroin suppliers stepped in to fill the void. Kolodny says to get the heroin epidemic under control, doctors and dentists have to prescribe opioids more cautiously. And the hundreds of thousands of people already addicted to heroin — and prescription painkillers — need to find treatment.